Our brand new Bar Bracelet allows you to glance down at your wrist to catch sight of your mantra through the day. Take inspiration from the simplicity of the word, 'breathe', and bring to mind the full mantra, 'I breathe in calmness, I breathe out stress'. The perfect mantra to embrace serenity; for meditation; or to soothe a busy mind. 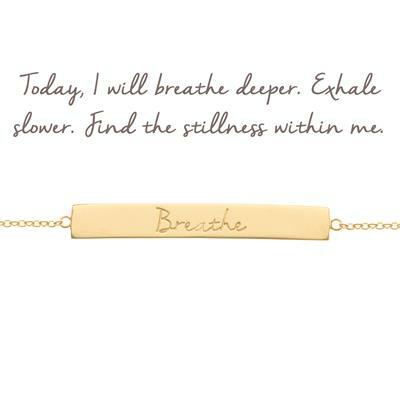 Designed to promote calmness and aid mindfulness, this mantra encourages you to dispel anxieties and feel at peace. Breathe in deeply, hold, then breathe out. Mantras are powerful words, designed to have a positive effect on how we feel. Repeating a mantra uplifts us; it reassures and motivates us. Most powerfully of all, it can bring self-belief. Look down at your bracelet from time to time through the day, and say its mantra to yourself, when you need a moment of peace and calm. A mantra is a powerful phrase, intended to make a positive impact on the way that we feel. Repeat your mantra to inspire yourself. It will give reassurance and comfort, as well as motivating and energising you. Look at your bracelet, and repeat its mantra to yourself several times a day.